ASTM D8071, hydrocarbon type analysis of gasoline using GC-VUV, has already proven itself a reliable alternative to ASTM D6730, detailed hydrocarbon analysis of gasoline using GC-FID (DHA), delivering PIONA results with a GC run under 34 minutes. However, many applications still use DHA because of its ability to speciate the large number of compounds in gasoline. 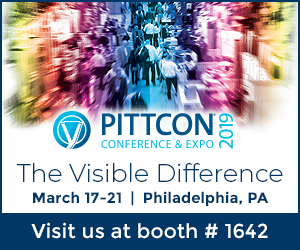 With ASTM D8071, we take advantage of GC-VUV’s ability to spectrally deconvolve coelutions and quantify PIONA classes, but the method isn’t designed to provide speciation of everything in gasoline. For those who want the speed and reliability of GC-VUV while maintaining speciation, VHA is the answer. VHA provides full speciation of as many as 150 compounds in gasoline, making up approximately 90% of most gasolines, while still providing accurate PIONA data needed for gasoline analysis. All of this is achieved in a GC run of approximately 50 min, making it a very useful alternative to DHA (Figure 1). Figure 1. 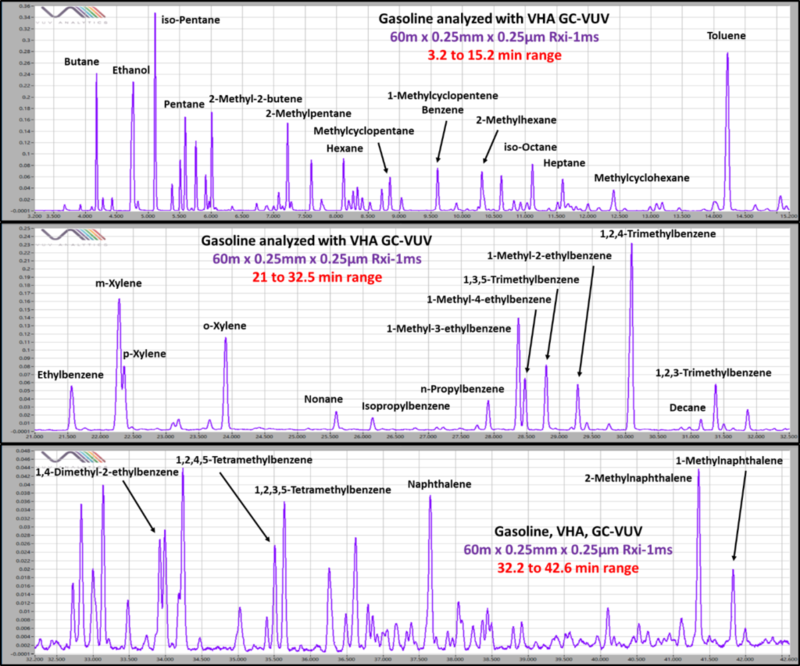 Partial breakdown of a gasoline sample analyzed with GC-VUV VHA. On top of speciation, VHA provides full PIONA characterization with a GC run of about 50 minutes. GC-VUV has proven itself a worthy complementary technique with GC-MS. GC-MS is helpful to GC-VUV, too. The NIST mass spectral library, for example, has many decades of entries over the VUV library. We can take advantage of GC-MS and use it to build out the VUV spectral library. Normally, new compounds are added to the VUV spectral library by purchasing reference materials, collecting their spectra with GC-VUV, and establishing their response factors relative to a known compound, such as benzene. However, as outlined in ASTM D8071, most PIONA compounds will have shared class-based response factors; for example, isoparaffins have a relative response factor of 0.781. This means that if we can obtain spectra, we can often make entries for new PIONA compounds without purchasing any reference materials! This combination GC-MS/GC-VUV concept has already been demonstrated on multiple occasions. For example, several olefins were added to the library using samples with high olefin content (Figure 2). Figure 2. Example process of adding a new olefin spectrum to the VUV spectral library. In a sample with a high olefin content, several peaks were misidentified (top left) during initial GC-VUV data processing. The sample was analyzed using GC-MS, and these peaks were identified as olefins, such as a new C12 olefin (bottom right). After adding these to the VUV spectral library, the sample was reanalyzed and accurate results were obtained (top right).